Hello! 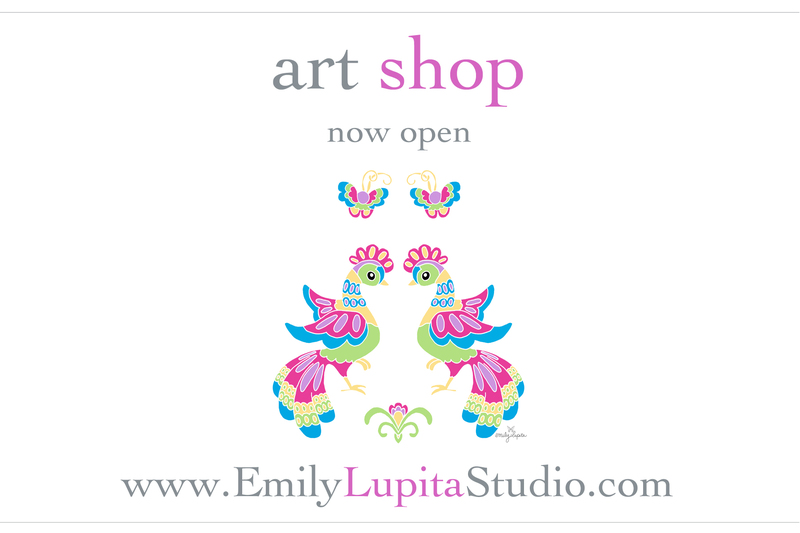 My name is Emily Lupita and I’m the artist & designer behind Emily Lupita Studio, the curated online art shop featuring my original watercolor paintings, art prints, cards, ornaments, and handmade artwork jewelry. I’m also an international educator and a poet & writer. My most recent book, The Artist’s Alphabet: 26 Words to Encourage Creativity, was published in 2013. I enjoy writing about travel & art and sharing behind-the-scenes views of my creative process on my weekly blog. I believe that our life is a canvas and the way we live each day is our art. This is what I hope my art says about me – that I am a believer in the flower of hope that continually blooms near the path to encourage us along our journey of life. I paint with irodori antique watercolors and sakura inks on 100% cotton paper. I also make ink & digital color illustrations. 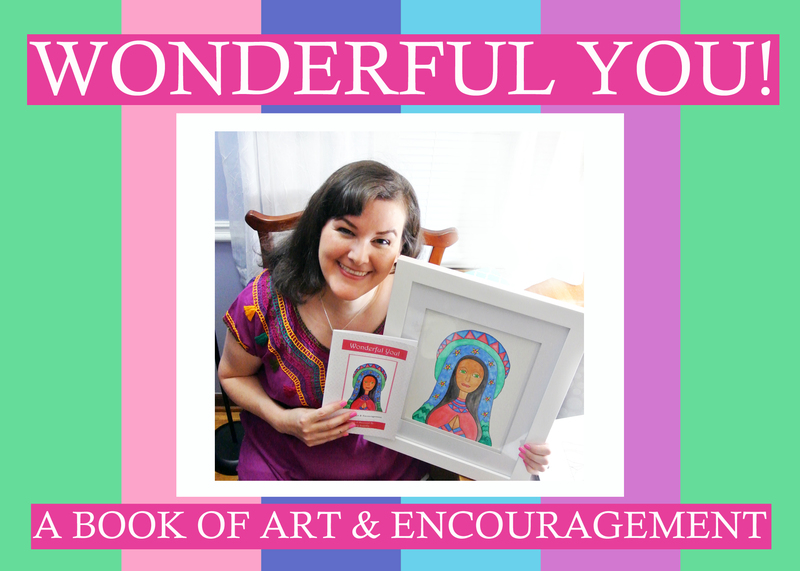 My favorite thing is to create different manifestations of “Lupita” – my artistic vision of women from around the world expreiencing heartfelt moments. Lupita appears in many forms, including as an angel, monster, in dreaming form, and as a traditional Japanese faceless beauty dressed in kimono. Her world is made up of brightly colored animals, birds, flowers, and mountains. She prays, dreams of rainbow wings, finds a way, enjoys the wind in her hair, and travels the world. Lupita represents my inward significance. I come from a diverse background and am inspired & influenced by the beautiful artistic aspects of my family’s different lines of cultural heritage. I’ve been very fortunate to have traveled to many amazing places across the globe to study, work, visit family, and explore my motherlands (and beyond). These journeys across more than fifteen countries & five continents have influenced my life in the most fundamental ways. My travels have also served as the foundation for my artwork – color combinations from Mexico, use of space from Japan, patterns from Turkey & many more influences from around the world. I’ve been a life-long artist…some of my very first memories are of drawing pictures with my family at the kitchen table of our farmhouse in rural Iowa. I began painting my trademark Lupita art series while living in Japan after college, where I had my first solo art show at the prestigious N.A. Gallery in Miyzaki Prefecture and my first book, Water & Stone / Mizu to Ishi was published by Koumyakushya Press. Since then, I’ve shown my paintings, artwork jewelry & glass beads at a variety of art shows & festivals in the United States including the Octagon Center for the Arts Community Artists Exhibit, the Waterloo Center for the Arts Juried Art Show, and the Quincy Center For the Arts Japanese Art Exhibition, among many others. I’m currently exhibiting artwork at The MSAA Gallery and The Nite Gallery. I have a Bachelor of Arts degree from Central College and a Master of Fine Arts degree from Iowa State University. In 2013, I started my own small business, Emily Lupita Studio, and launched my own publishing press, Emily Lupita Studio Press. For a full list of publications, exhibits, and shows, please visit my Bio page.